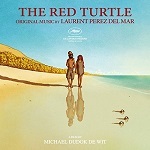 An utterly transporting and beautiful silent animation from Studio Ghibli, The Red Turtle (or La Tortue Rouge) stunned audiences at the Cannes 2016 Film Festival and received warm notices on its UK release back in May. Belgian director Michael Dudok De Wit oversees this exquisite silent animation about a man shipwrecked on a remote tropical island whose attempts to escape on a raft are repeatedly stymied by the red turtle of the title. Overcome with rage, the unnamed central character then flips the turtle on its back and leaves it to its fate - only for the story to then spiral off in a myriad different directions touching on life, death, birth, our place in the universe and, most specifically, our relationship with nature. It's an extraordinary film rendered in pure visual wonderment. 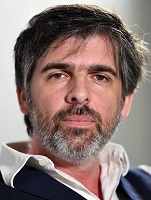 Of course, being silent (aside from odd grunt, noise and exclamation), the emphasis is further thrown onto the score, composed by Laurent Perez Del Mar who has surely come up with one of the year's most haunting. A relative unknown outside of his native France, where he is already the recipient of both Cesar and Annie awards, this score will surely bring the composer to widespread attention. As always with silent cinema it's imperative that the music become the inner dialogue of the characters, both commenting on the situation and adding further layers of nuance that enhance our understanding. Fully orchestral with occasional emphasis for solo intruments and percussion, it's a score that beautifully captures the sweep of the story, both intimate and grandiose when it needs to be. Interestingly the album presents the music out of film order, allowing the score to stand as a separate listening entity on its own terms away from the visuals, another sign of Del Mar's craft and care with the project. It's all centred around a soaring central theme that recalls Ennio Morricone at his best. Strings, soprano vocal and gentle winds carry the opening 'Love in the Sky' to quite heartrending proportions and this theme washes over the rest of the score, notably in the awe-inspiring 'Flying with the Turtles', 'The Dream', 'He Has to Go' and 'I Will Stay With You'. There's more than a touch of James Horner's much-missed intimate touch in 'The Girl', 'The Baby' and 'White Hair', ones that play around with featherweight woodwind textures in delightful fashion. However given the themes of the story this is also a score that often pulls in a darker, more mature direction. This challenging material is a pleasing ballast to the score's melodic moments, with the rumbling, powerful 'The Tsunami' playing the main theme in anguished counterpoint. Meanwhile the bleak 'Despair' and 'Anger' pit toiling strings against rumbling timpani, full capturing the more brutal aspects of man's challenging relationship with the sea. Percussion of an altogether lighter, more captivating kind comes in the closing 'Second Raft, woodblocks and glockenspiel reflecting the scurrying crabs that play an important comic relief role in the storyline. It's a rare pleasure when one discovers a stunning score from a relatively unknown composer. 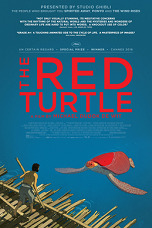 The Red Turtle is that score, the sort of lushly thematic and orchestrally robust treat that earmarks Del Mar as a serious talent to watch. Working closely with Dudok De Wit to both draw out and accentuate the movie's themes in as accessible and audience-pleasing a way as possible, Del Mar's achievement is a profound one. Highly recommended and available from Amazon.com and Amazon.co.uk.